Today’s the day the Bombay Sapphire Gin Journeys at the Sanderson Hotel get going. 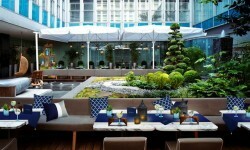 Right up until 15th October people visiting the Sanderson terrace in Berners Street between 3rd September will experience an exotic journey to the ends of the earth, travelling to the Mediterranean, West Africa and Asia to discover the beauty of Bombay Sapphire. Inspired by the gin’s 10 botanical ingredients and the journeys taken to source them, the six week long pop-up will transport consumers around the world through an immersive sensory experience. An exclusive menu of tempting Ultimate Gin & Tonic twists inspired by each botanical region will be on offer, alongside a bespoke selection of light snacks to compliment the exotic menu and stunning surroundings. On Tuesday and Wednesday evenings from 6.30pm, Bombay Sapphire brand ambassador Renaud de Bosredon will be available to guide groups of consumers through an elevated sensory journey. During the bookable sessions, twelve consumers will have the opportunity to discover and explore the signature cocktails via a series of creative experiences. ‘Gin Journeys at Sanderson’ will run alongside the existing Sanderson Sessions, which take place every Wednesday, showcasing some of the UK’s most exciting up-and-coming musical artists. ‘The Gin Journeys at Sanderson in association with Bombay Sapphire’ will be open daily from 6pm until late, from Thursday 3rd September until Thursday 15th October and will take place at The Sanderson, 50 Berners Street, London W1T 3NG.